This is a quick introduction explaining how to install LispWorks, and then use it to try out the tutorials on this site. These instructions are for the Mac; some of the details will be slightly different under Windows on the PC. Note that the programs in this tutorial contain intentional bugs! Run the installer, and follow the instructions. Double-click the LispWorks Personal icon to run LispWorks. 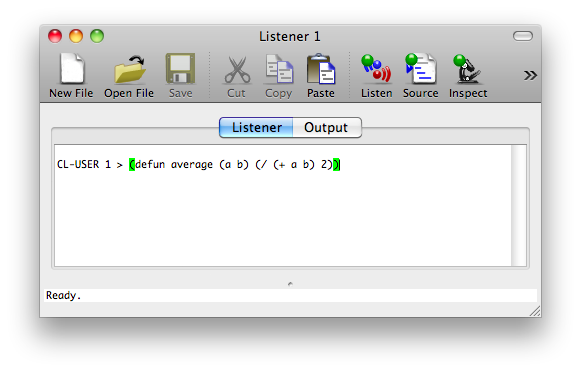 The toolbar will be displayed, together with a Listener window. If you are running LispWorks on the Mac there are two preferences you will probably want to set. 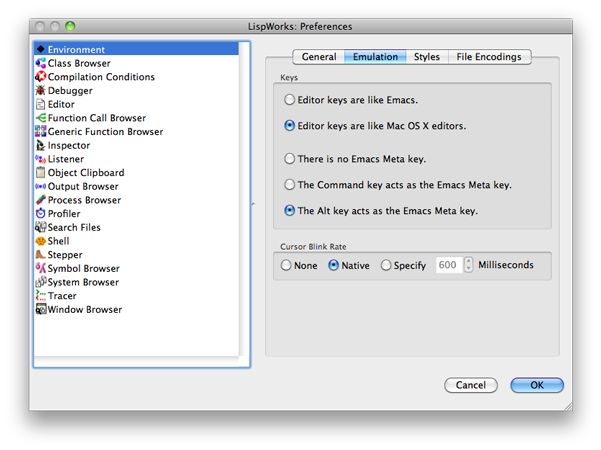 Choose Preferences… from the LispWorks menu. Select Editor keys are like Mac OS X editors. Select The Alt key acts as the Emacs Meta key. 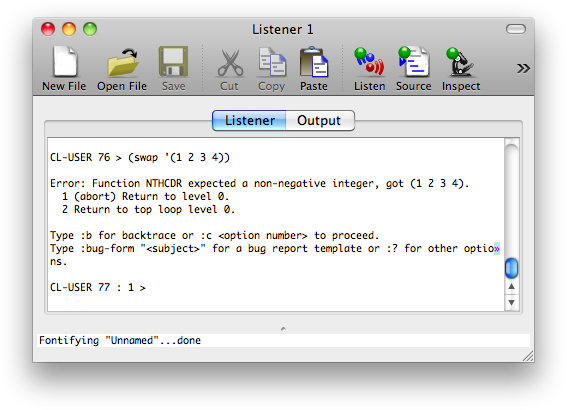 The Listener is Lisp's interactive command window. You can evaluate an expression, or find the value of a variable, simply by typing it at the > prompt, and pressing Return. When you're programming it's very easy to create an error that causes the program to run for ever, in an infinite loop. you'll see that the program is stuck in a loop, endlessly printing "Hello". The solution is to hold down the ctrl and cmd keys, and press the comma key. 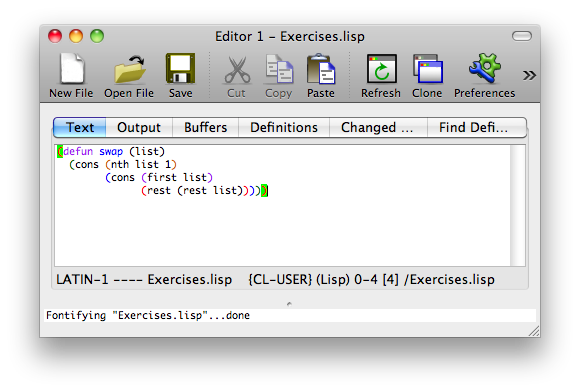 LispWorks also includes an integrated text editor which allows you to enter and edit programs, save programs, and load programs from disk. If you have opened several files you use the Buffers pane to select which file you want to edit in the Text pane. For example, suppose we are writing a procedure swap to swap the first two elements of a list. Choose New from the File menu to display a new Editor window with the Text pane selected. 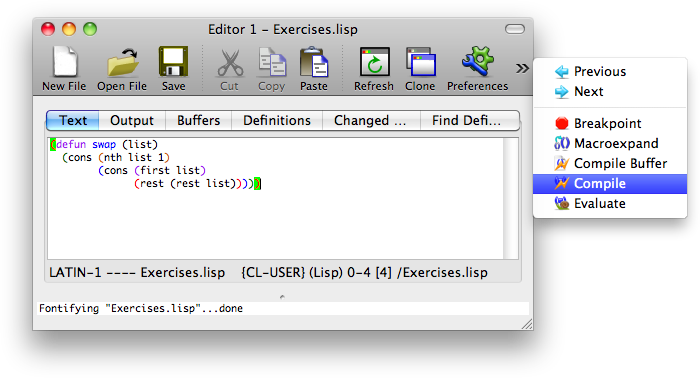 Choose Save from the File menu, and enter a name for the file, such as Exercises.lisp. Alternatively, choose Compile Buffer to compile all the definitions in the Editor window. The compiler messages will be displayed in the Output pane. Press space to return to the Text pane. 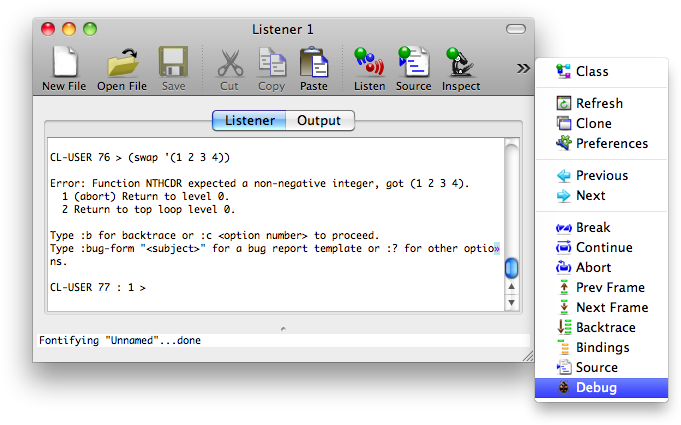 The most convenient way to debug a program is to use the interactive debugger. The Debugger window will be displayed. This shows the history of how the error occurred, called the Backtrace, listing the functions that were called, and let's you see the internal variables (including any arguments) at the point that the error occurred. The labels of the arguments, ORIG-N and ORIG-LIST, are a hint that we've got the arguments to nth the wrong way round. 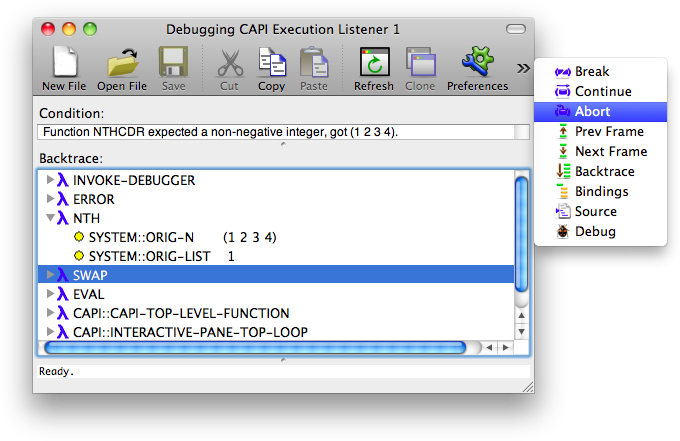 Double-click the SWAP line in the Debugger window. Correct the mistake by changing (nth list 1) to (nth 1 list), and compile the corrected version of the definition of swap. If you try evaluating swap again it should work this time. Sometimes the bug you're trying to fix doesn't cause an error, but just causes your procedure to give the wrong result. That's clearly not what we wanted. The Debugger is helpful here too. We can insert what's called a breakpoint into the program, and this will cause the debugger to be displayed so we can examine the contents of the variables at that point. Test it as before by typing (last-elt '(1 2 3 4)) in the Listener. The breakpoint causes an error called Break. 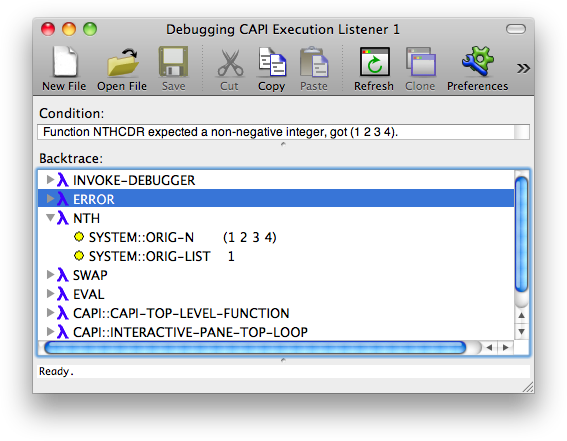 Select Debug to display the Debugger window, as before. We can now examine the values of the variables list, len, and last at the breakpoint. Exit from the debugger by selecting Continue to continue running the procedure from the breakpoint onwards. LispWorks includes a number of other tools to help with debugging Lisp programs, but this tutorial has covered the essentials. 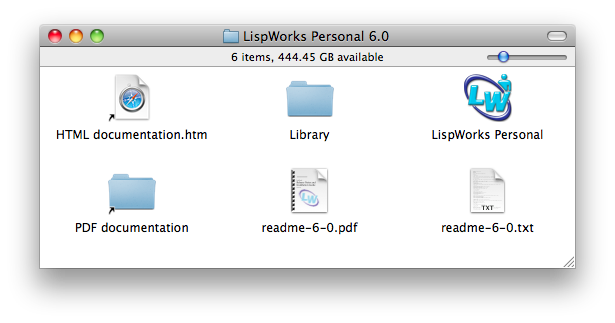 For details of the other features refer to the documentation provided with LispWorks Personal Edition.